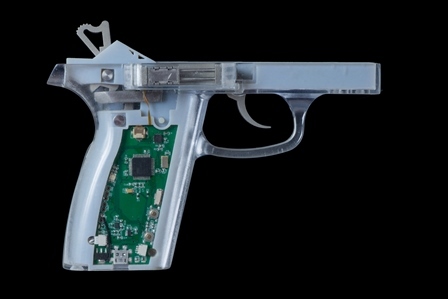 A freshman student at the Massachusetts Institute of Technology built the first prototype of a smart gun that scans users’ fingerprints to ensure they have access to the firearm before enabling it to shoot. Kai Kloepfer introduced the smart gun prototype last month and is searching for a team of engineers, technology experts, and gun manufacturers to assist him in continuing the development process for the next 12 to 18 months. Kloepfer is also working to gather funds for his team from investors and other resources. Even though Kloepfer has been attending MIT only for the past three months, he understands how the campus is “one of the best places in the world” to build his company, Biofire. Kloepfer said that what he wants most from smart guns is that they always work when the correct owners scan their fingerprints. Kloepfer said that the smart gun needs to be easy to use and needs to be transparent, meaning that it requires no extra steps from a normal gun in order to fire. In Kloepfer’s prototype, the fingerprint sensors are located in the spots that users would naturally place their thumbs in order to fire. The user could activate the gun in the same amount of time and in the same way that it takes to pick up a regular gun. The gun allows multiple users to become registered for use, allows owners to sell it to a new user, unlocks in less than one second, and includes a year’s worth of battery life in one charge. Kloepfer began researching smart gun technology as a sophomore in high school for a science fair project. The science fair was scheduled soon after the 2012 mass shooting at an Aurora, Colo., movie theater, which was about 45 minutes away from where Kloepfer lived. Kloepfer wanted his project to have more impact than the robots he had built for previous science fairs. “What is there I can do with engineering to deal with a mass shooting?” Kloepfer asked himself. Kloepfer researched shooting deaths and found that most are the result of accidents or suicides. Every 30 minutes a child or teenager is killed by a gun and 55 percent of firearms are kept unlocked in homes with children, according to Biofire’s website. When Kloepfer began talking to people about his idea to develop a smart gun he encountered different opinions, including people who wanted to “give [him] money on the spot,” to people, “cursing [him] out.” When Kloepfer heard negative reactions, he explained his reasoning for making a smart gun that could prevent accidents and suicides by restricting unidentified users. However, the gun industry isn’t used to cooperating with the technology industry, according to Kloepfer. Kloepfer said that the gun industry often updates its products and experiments with new types of marketing, but they’ve never worked with a smart gun. Kloepfer noticed that when putting together his development team, it’s hard to find young engineers that also have experience in gun manufacturing, which is persuading him to turn toward people with more experience in the firearms industry. Kloepfer said that most people he encounters assume that the National Rifle Association is against the use of smart guns, but the organization is against the use of regulations that would require gun users to purchase only smart guns. Kloepfer agrees with the NRA in this instance. “We’re strongly against smart gun mandates,” Kloepfer said. Kloepfer said that the smart gun technology he designed isn’t suited to be applied to every part of the gun market immediately. Since the fingerprint sensor doesn’t scan properly when it gets wet, the gun wouldn’t be appropriate for hunters or law enforcement who need to use the gun outdoors. The gun is designed for self-defense inside the home. “This is not gun control or an attempt at gun control,” Kloepfer said.